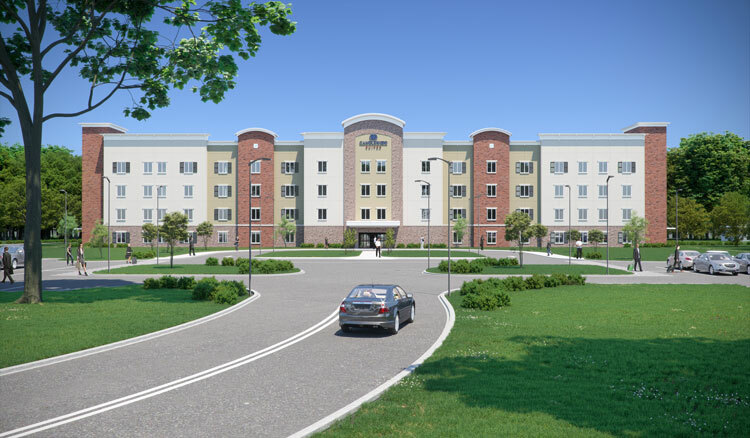 Lendlease begins construction on second CLT hotel in U.S.
Fort Drum, N.Y. — Lendlease, the exclusive developer for the Department of Defense’s only privatized lodging portfolio, began construction on the second mid-sized hotel in the U.S. using cross-laminated timber (CLT). The hotel, located on Fort Drum in Watertown, N.Y., is part of Lendlease’s more than 12,000-room Privatized Army Lodging (PAL) portfolio. Lendlease completed the first CLT hotel in the country in March of 2016, also part of the company’s PAL portfolio. Made of several layers of pressed lumber board stacked in alternating directions, CLT offers builders maximized strength and durability with added sustainability and conservation benefits. CLT provides an exceptional exterior wall performance for the building envelope, and the hotel’s design is compliant with the Unified Facilities Criteria (UFC) Anti-Terrorism Force Protection requirements for blast performance and progressive collapse. Lendlease has pioneered the use of CLT around the globe, including Forté Living, Australia’s first multi-residential CLT building, and the Library at the Dock, Australia’s first public CLT building. Additionally, Lendlease successfully delivered Australia’s first CLT commercial office building, International House, in its highly sustainable Barangaroo development in Sydney. The more than 65,000-square-foot structure will include nearly 100 rooms, and will incorporate CLT for the hotel’s floors, roof, exterior walls, shaft walls and select interior walls. CLT installation began in November of 2017, and the project is scheduled to be completed late winter 2018. More than half of the installers are military veterans, several of whom were hired through the Fort Drum “Soldiers for Life” Transition Assistance Program. Lendlease is the owner, developer, design-builder and asset manager for the Candlewood Suites hotel on Fort Drum. IHG (InterContinental Hotels Group) is the hotel operator and manager of IHG Army Hotels, which are located on 40 US Army installations and provide service and amenities tailored to meet the needs of military travelers.